This activated carbon air filter effectively removes odor and particulates from the air through physical filtration as well as chemical absorption. Used in conjunction with a centrifugal inline fan, fresh air can be obtained even in an environment where organic fertilizers are used. 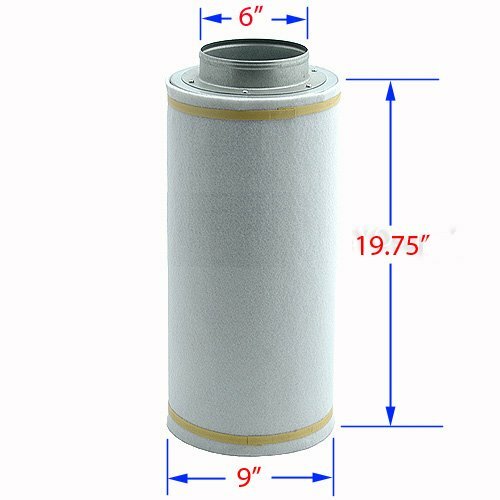 This filter is suitable for use in greenhouses, hospitals, lavatories, public buildings, food processing facilities, etc. Features * Activated virgin carbon removes 99.7% of volatiles from the air * Pre-filter removes dust and airborne particles * Completely maintenance free * Can be used to clean incoming or outgoing air * Discreet packaging Technical Specification Flange 6-Inch CFM 470 Carbon Type Active CTC60 Average Life Expectancy 1.5 years Package Content * (1x) 6-Inch carbon air filter Note: If the filter comes with the pre-filter installed over the plastic bag, please remove plastic before use as follows: 1. Remove filter from box. 2. Untie plastic bag. 3. Put filter down on its side. 4. Gently pull on the plastic bag from the bottom end of the filter. Slow rolling of the filter from side to side while gently pulling out the plastic would ease the process.